Helicopter tour to Everest base camp Nepal, landing at mt Everest base camp view point with best view of top of the Everest. Join Helicopter tour to Everest Base camp Nepal from Kathmandu, USD 1400 per person (if 3 pax), one day trip with base camp landing, limited dates for special discount, get our promotional offer, book today. Below confirmed departures for helicopter ride tour to Everest base camp with landing. 4 to 5 hours Everest base camp landing tours join now, get lowest cost offers. $ 4000 can share this cost between 1-3 pax. if you are 2 pax already we suggest to take private trip just USD 2000 each- guaranteed daily private flights. Hotel pick up and drop is included. Our Nepal Everest base camp Helicopter flight starts from Nepal’s Kathmandu airport. It continues to Lukla then Namche Bazaar, Pheriche Gorakshep and mount Everest Base Camp. After Kalapathar, return to Everest view hotel for Breakfast break then to Lukla. Final take off from Edmund Hillary airport continues to Kathmandu airport. Himalaya holiday service welcomes you in our fascinating Helicopter tour to Everest base camp Nepal. This trip is on a chopper to world’s highest valley of Khumbu and mount Everest region. Early morning depart from respective hotels and get transferred to Kathmandu domestic airport. This flight is mind blowing and wonderful helicopter flight towards mt. Everest base camp. Soon after taking off from airport we see panorama of green hills and Kathmandu valley . we get awesome parallel range of snow capped mountains towards west Mt. Manaslu, Ganesh Himal, Langtang and Jugal Himal. As the flight continues more views of mid east and far eastern Himalayan peaks of Mt. Gaurishankar, Melung Tse, Numbur, Cho-Oyu. Through the cockpit can point Mt. Everest, Lhotse and as far to Mt. Makalu. helicopter tour to Everest base camp Nepal looking for mount Everest from helicopter. Helicopter tour to Everest base camp reaches to Lukla 2,820 meters high. 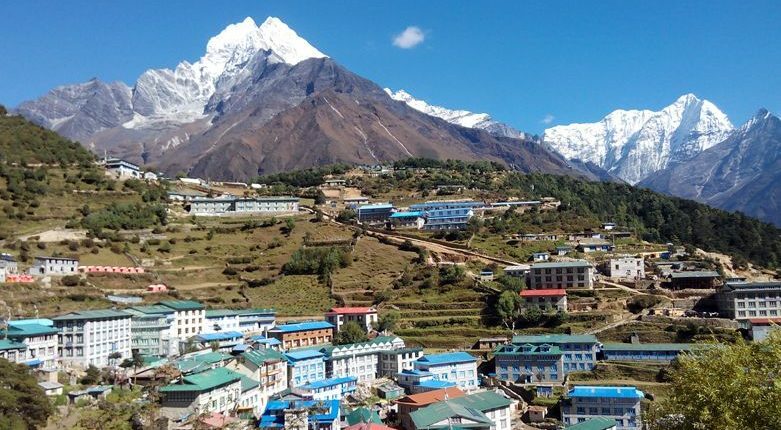 it is a moderate size town the gateway to Everest for trekkers and mountaineers. From here , we get best views of Kwangde peak and lower valley. Flight continues heading to famous Namche Bazaar 3,440 meters high “Sherpa Capital”. It has all modern facilities banks, ATM machine, hotels, restaurants, shops, stores, cyber café with government offices. Namche offers tremendous views of Thramasarku, Kwangde, Mt. Everest, Lhotse and majestic Mt.Ama Dablam. Namche is door to Everest. After Namche we will be heading to a scenic and renowned spot at Tyangboche Monastery located at 3,867 meters high. From this hill we see panorama of Mt. Everest, Lhotse, Nuptse, Lhotse Shar, Kangtega, Tharmasarku, Kwangde with close views of stunning peak of Ama Dablam. Trekkers take a brief visit of monastery with Lamas (priest) on prayer. All expeditions group takes blessing here for safe climbing to the top. From here heading to Pheriche where the tree lines fades in the barren. A dry land of Pheriche at 4,230 meters high with many lodges to serve the trekkers . This place has HRA (Himalayan Rescue Association) small health post. With a view of this area we continue to our main destination at Mount Everest Base Camp at 5,367 meters high. we fly over Khumbu ice falls and glaciers. During climbing season this place is flooded with camping tents and climbers. After an exciting moment with stopping on the way to Kalapathar where views of Mt. Everest can be seen at close distance with Mt. Pumori towards North. Having short fascinating time here of helicopter tour to Everest base camp, we continue flight back to Everest view hotel for some break. Then fly to Kathmandu and transfer back to hotel. Hope this wonderful and overwhelming time for about 3 hours in the world highest Mt. Everest be your life time experience. • Car/van transportation to and from domestic airport and hotel in Kathmandu. • Escorting guide for this Everest flight. • Private helicopter for 4 hours . • Everest national park fees, now USD 34 or equivalent to local Nepalese rupees. • breakfast at Everest view hotel. Note: we need to calculate weight of the passengers so please mention your weight for helicopter flight to Everest during your inquiry. Learn more about the helicopters who flies to Everest base camp for daily tours and rescue purposes. List of Helicopters on use: Air Dynasty Helicopter, Shree air Helicopter, Simrik air Helicopter, Fishtail air Helicopter, Manang Helicopter, Mountain helicopter and Muktinath Helicopter. • Experience from previous Travelers ! • A special trip to Himalayas and Mount Everest Base cam: we were looking for a special trip to Himalayas and Mount Everest Base camp. E-mailed several companies and got responses but Found HHS Pvt. specially Mr. Rajan very professional and competent in business. He arranged our Helicopter flight to Everest base camp with landing. we took many photos and videos. But landing place Kalapather with best view of Base camp and Everest was windy and cold so i suggest to any one who want to fly and land there take warm clothes. Alex from California, USA.